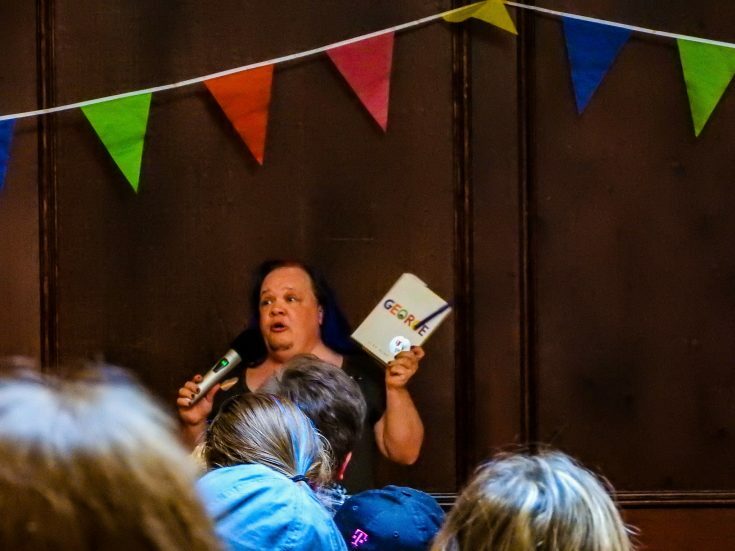 Close to 250 people crammed into the second-story ballroom of the Backstop Bar Grill in Canby on Sunday to hear from Alex Gino, a non-binary author whose debut novel about a transgender fourth-grader was removed from the local reading list for the Oregon Battle of the Books by the Canby School District. 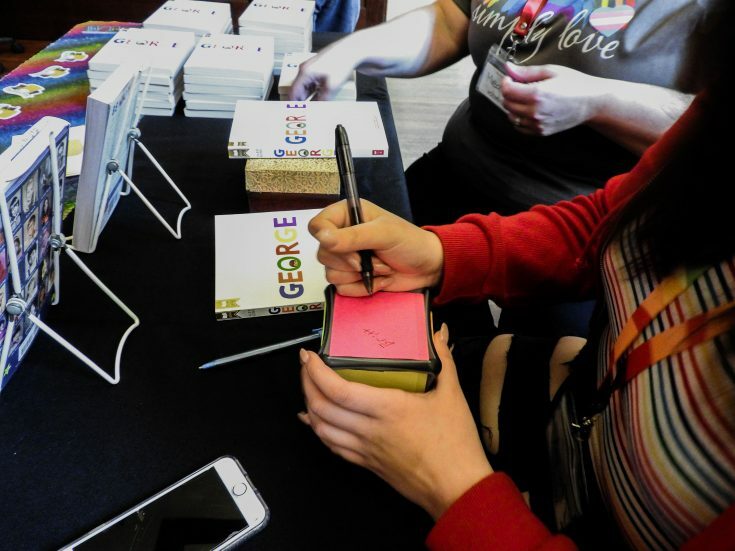 Alex, who uses they, them and their pronouns, shared about their experiences as both an author and a genderqueer person — one who, unlike Melissa, the protagonist in their award-winning novel George, grew up without a strong support network of family and friends, or even language to understand themself. 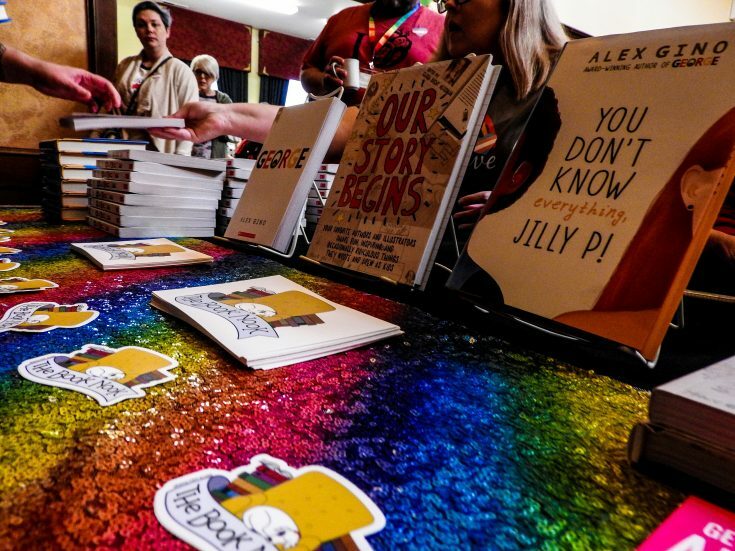 The event was organized and sponsored by Victory Point Property Group and The Book Nook. 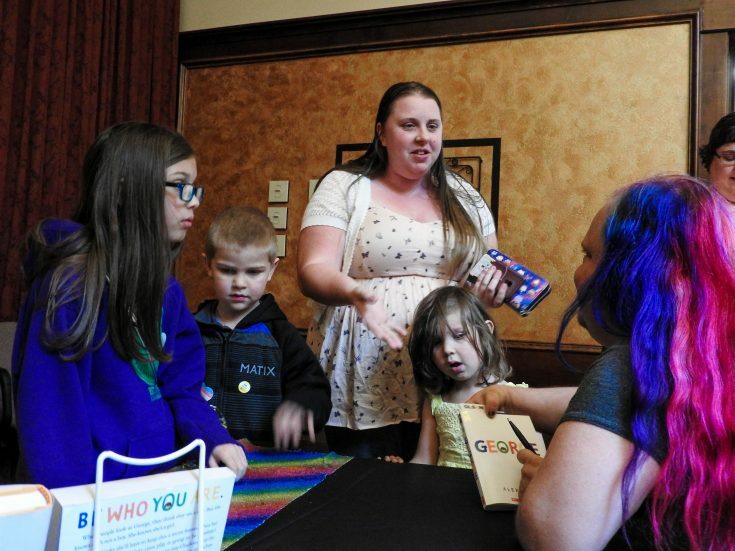 Victory Point Realtor Sarah Spoon, also a Canby city councilor, said they began planning the event about six months ago, back in the fall, and this date just happened to work with Alex’s schedule (they were going to be in the Portland area this week for some other events). 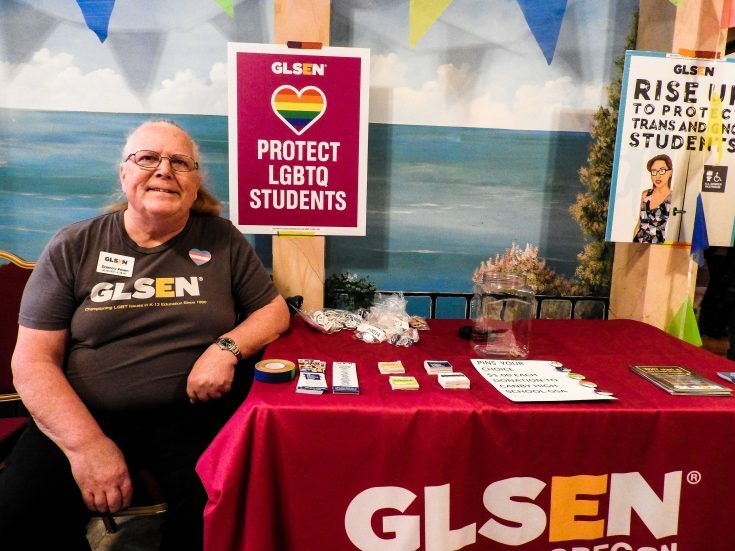 There were also some supportive organizations in attendance, offering free resources for local LGBTQ youth and families, including Basic Rights Oregon, the Fierce Families Network, PFLAG, GLSEN and the Canby Transgender Alliance, a group that formed just this past week. 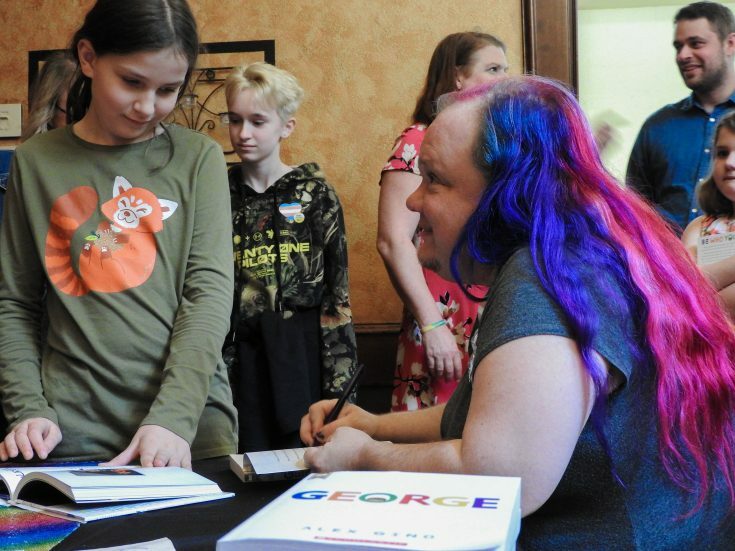 Given that the event fell on March 31, International Transgender Day of Visibility, Alex did something they don’t usually do at these kind of events: they read the ending of George, in which Melissa publicly presents herself as a girl for the first time during a trip to the zoo with her friend Kelly. They also answered questions from the audience, the majority of them from the many children who were in attendance. 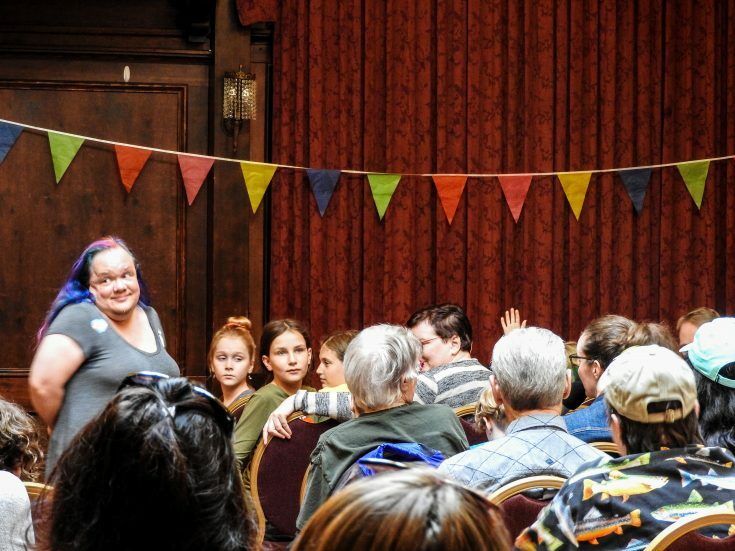 As someone who has attended a lot of community gatherings, in Canby and elsewhere, it has been a long time since I’ve seen a crowd so supportive, enthusiastic and engaged. 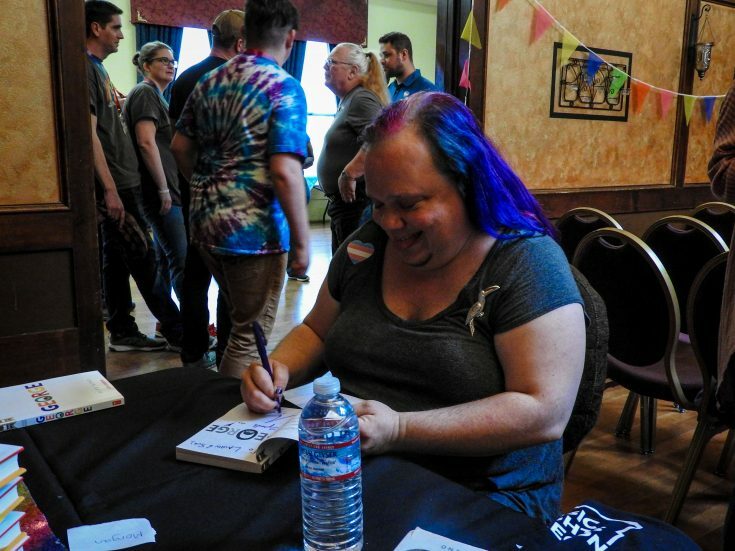 Alex was interrupted frequently by laughter and applause. Most everyone who asked a question was applauded as well, just for asking the question. 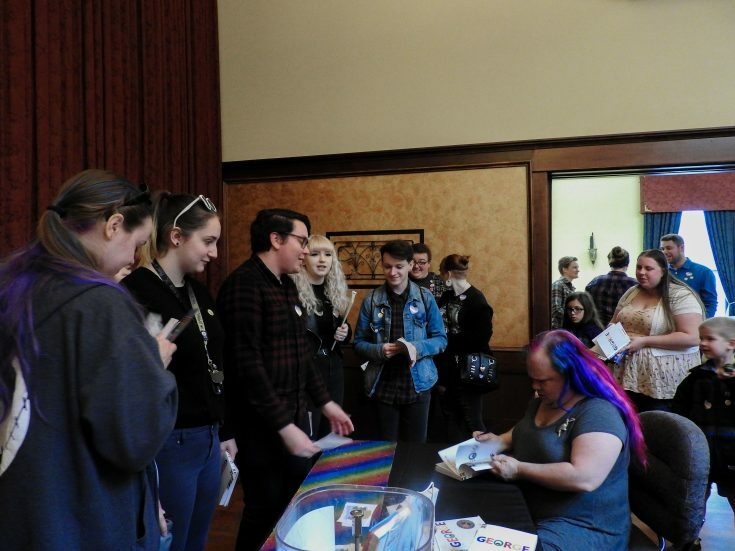 The line to have a book signed wrapped around the room and took almost an hour to get through, and no one seemed upset about it. Plus, I didn’t hear a single complaint about parking in downtown Canby. The positivity was contagious. Outside, there was not the furor that some had quietly feared. Anyone who wanted to attend was graciously welcomed. There was no protest, no angry chants, just a handful people who drove slowly by, taking cellphone photos and videos they attempted to post to Canby Facebook groups. Most didn’t stay up for very long. 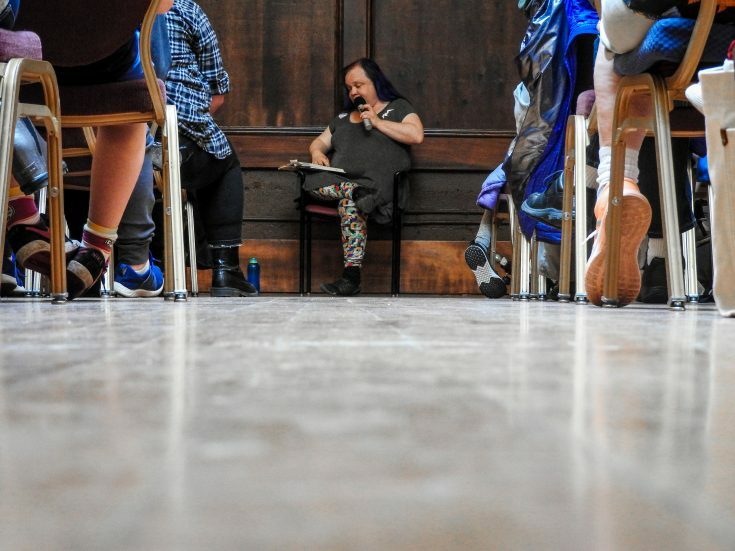 The interest of these would-be paparazzi was most likely three members of the Portland Sisters of Perpetual Indulgence, a nonprofit dedicated to the support, education and development of the LGBT community. Oh — they’re also men who dress in drag, with elaborate headdresses and makeup. “We just wanted to support the community down here,” they said. I had expected the March 20 meeting to be a sort of focal point of this event. The story, and the turmoil it had generated on social media, had certainly been a big part of my experience over the previous week. But that one comment from the Sisters outside was the only time I heard it mentioned. Alex was aware of what had happened but didn’t bring it up during their talk. Nobody asked about it in the Q&A. I also expected to feel out of place, as a straight, cisgender man, who only just recently learned what the word “cisgender” means. But I was wrong about that, too. As a reporter, you often feel like a trespasser in someone else’s world — whether you’ve been invited in or not. But not here. I felt completely welcome, and that was very much appreciated. Photos by Rose Covered Photography.